In the fast-changing media sector, flexibility is an important aspect of what Media Inventions delivers. Usually, timescales are tight and maintaining quality is paramount. Whether it's a product review for a newspaper website, or a news item for TV, clients demand the ability to "go the extra mile" whilst remaining willing and cheerful. Remember the examples on this page give you some idea of our capabilities, but they are not exhaustive so please contact us for any video or DVD related projects. Just pick up the phone or drop us an e-mail about your next project! Many products lend themselves to being reviewed on video. Traditionally, the video medium was restricted to television companies and broadcasters; with the advent of online video, the target audience has increased dramatically and this has enabled a new group of media companies to become online broadcasters. Many of these come from the traditional print media background, augmenting their paper content with rich, compelling content online. 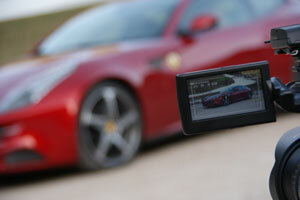 We work closely with a number of companies, including The Sunday Times, to produce automotive reviews. Music Videos have become hugely popular with the explosion of online video providers such as YouTube. Most serious bands need some form of video to promote themselves to record companies and managers, as well as venue co-ordinators and booking agents. Media Inventions provide a comprehensive video service ranging from filming a live gig using multiple cameras (see our shows and events section) to a complete dedicated music video shoot. We offer a selection of packages to suit most bands and budgets. For more info on live show filming see our shows and events section here. Video is a powerful medium to get a point across. 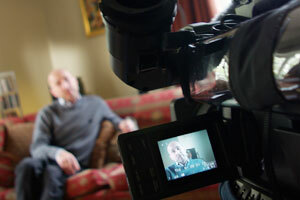 Written testimonials become much more powerful if delivered on video by the writer. This benefit, combined with the ability to illustrate clearly, makes video a useful tool in any campaign. Media Inventions has been involved in various campaigns for major media organisations. In the example below, TraderMedia group wanted to raise awareness of the high accident rate amongst younger drivers and used a series of online videos with well-known celebrities as well as those that had suffered in road accidents. These were delivered as a series of podcasts. Certain events and features work really well on video. Examples include motor racing events, news items, and show coverage. Video of these events offers compelling and surprisingly cost-effective content for websites. The video is often used to augment newspaper stories. The example shown below is a feature that supported a print article in The Sunday Times on the efficiency of a new BMW 3-series. Fifth Gear presenter and Top Gear Magazine editor, Tom Ford was tasked with attempting to get 1,000 miles from a single tank of diesel. The extract below shows how he got on. A well-designed showreel can be an extremely effective tool in getting work. Every TV presenter has one... Media Inventions offers a complete showreel package to both presenters and agents, incorporating existing footage in any format, graphics and broadcast-quality titles and captions. The standard showreel package includes an automatic update service to ensure that the artist's latest work is always part of the showreel. Additionally, showreels can be published on the web, either on YouTube, Facebook, or other video sharing and social media sites or hosted on Media Inventions stable video servers. Media Inventions standard showreel package includes quarterly updates, web hosting and fixed price for additional copies on DVD.